You'll be £4.99 closer to your next £10.00 credit when you purchase Tracing Your Army Ancestors - 2nd Edition. What's this? Whether you are interested in the career of an individual officer, researching medals awarded to a soldier, or just want to know more about a particular battle or campaign, this book will point you in the right direction. Assuming the reader has no prior knowledge of the British Army, its history or organization, Simon Fowler explains what records survive, where they are to be found and how they can help you in your research. He shows how to make the best use of the increasing number of related resources to be found online, and he pays particular attention to explaining the records and the reasons behind their creation, as this information can be very important in understanding how these documents can help your research. An excellent introduction for the subject. The new edition is very useful for the ever increasing family history resources on the internet. The second edition of this best selling guide. Simon Fowler’ guide to tracing Army ancestors has been fully revised to reflect the many new military resources that have come online. This guide will also help with researching medals or indeed particular battles or campaigns rather than just individuals. It is what I call a ‘dip into’ book, for each chapter is packed with information some of wich may be immediate use whilst other information may not be relevant to your particular line of research. A complete beginner to family history? Your are exhorted by the author to read Chapter 1 and this I would fully endorse, beginner or not, to ensure that you have coered all that can and could be done before embarking on the quest of tracing your army ancestor. Having read Chapter 1 then follow your heart to the Chapter that would seem to echo your needs into army research. Most of the chapters are followed by lists of books to provide further reading and scattered throughout the book are references to ‘Further Information’. The appendices covering such items as army service numbers and army ranks are a welcome addition. … I found this book both readable and informative. A book to point budding genealogists in the right direction. Whether you are interested in the career of an individual officer, the medals of a particular soldier, or want to know more about a certain battle or campaign, Fowler explains what war records survive, where they can be found, and how they can help you in your research. 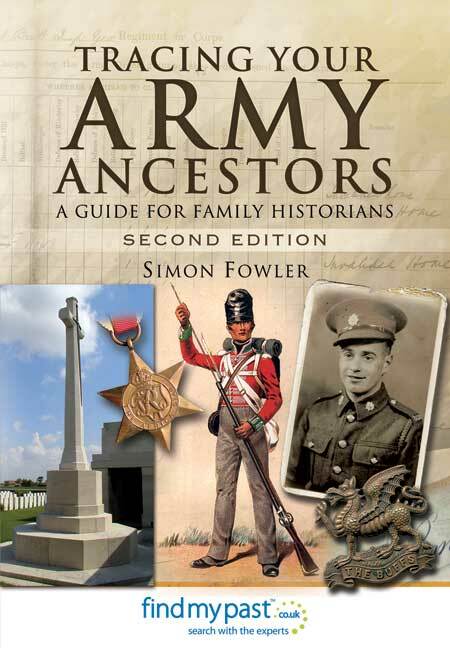 This fully revised 192-page book is the second edition of Simon Fowler’s best-selling guide to researching the British Army enables family historians to trace the military careers of individual soldiers from 1760 to the 1960’s. This new edition has been fully updated to include the latest online resources and information on the major archives and museums, which should ensure that your journey into the history of your family and loved ones is made that much easier. The world online resources and indeed the existing records self in archives and museums can be confusing to the novice, but Simon Fowler seeks to de-mystify them by explaining the records and reasons behind their creation, which can be very important in understanding how these documents can aid your research into family members. It’s a fascinating book on a fascinating and increasingly popular subject and at just £12.99 it’s a very modest sum to invest in your search for your family’s military history, and should help simplify the process into the bargain. This new edition of Simon Fowler’s, Tracing your Army Ancestors is a comprehensive and valuable introduction to the genealogical staple of military records, whether you are searching for one man or an entire regiment. Chapters include how to get started, organisation of the army throughout different periods, medals, records such as casualty lists and pensions, women in the forces, army ranks, and major conflicts, such as the Boer War and the two World Wars. An excellent guide for the uninitiated. Also from the pen of Simon Fowler comes this fully updated second edition of his best selling guide for those researching British Army ancestors from 1760 to the 1960's. The latest online information and resources appear, along with explanations about the records and reasons for their creation, which can greatly help you place your soldiers' careers in context. Simon Fowler is a professional researcher, writer and tutor specializing in military history and the two world wars. This interest dates from the time when he worked at The National Archives. As well as publishing many articles in magazines and journals, he has written several well-known books on military and family history, including: Tracing Your Ancestors, Tracing Your Naval Ancestors, Tracing Your Great War Ancestors: Ypres, Tracing Your Great War Ancestors: The Gallipoli Campaign and Tracing Your Great War Ancestors: The Somme. Find out more at www.history-man.co.uk.